Homicide detectives have been called to the scene of a North Carolina crash Wednesday evening that left Bengals wide receiver Chris Henry with very serious injuries in his back. Henry was listed in serious condition in a Charlotte-area hospital following a crash there. Police said Henry and his fiancée, Loleini Tonga, who lives in the area, had been arguing in the 800 block of Peachtree Road when Tonga tried to drive away in a pickup. Henry jumped into the bed of the pickup and the couple continued arguing as Tonga drove. Then Chris Henry fell out of the pickup at some point and landed in the roadway, causing life-threatening injuries. He was taken to the Carolinas Medical Center. His condition was not released. FOX Sports was reporting that Henry is on life support. No charges have been filed. Henry and Tonga have three children together. Tonga’s uncle, John Chisholm, said that Tonga and other family members were at the hospital where Henry was being treated. A source within the Cincinnati Police Department confirmed for WLWT that their officers went to the home of Henry’s mother to inform her of the accident and his condition. The response from fans Wednesday evening was one of concern as word began to spread about Henry’s condition. 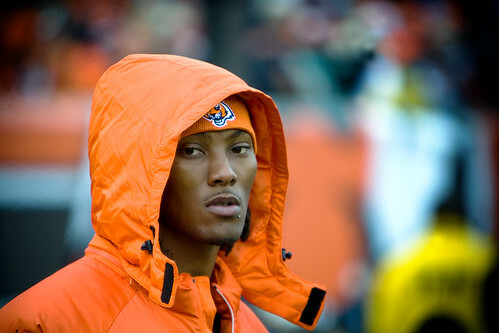 Chris Henry in twitter quickly became a top trending topic as people reported incorrectly that Henry had died. And on Henry’s Facebook fan page, people left messages wishing him well and praying for a quick recovery.